IK CoP Video Series (September 2018). See the flyer below for details and access the videos at bit.ly/IKMATHvideos. 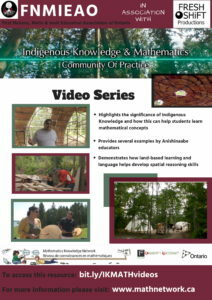 IK CoP Video Trailer: click the image below for an overview of the Indigenous Knowledge & Mathematics Education CoP! FNMIEAO Educator Conference October 28-29 2017: Held in London, Ontario; Special mathematics workshop series in connection with our Indigenous Knowledge in Mathematics Education CoP! Check out their flyers below and see their guidebook for conference details. Catch up with the Indigenous Knowledge and Mathematics Education CoP! See their latest updates here. 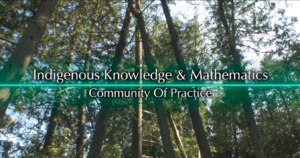 The Indigenous Knowledge and Mathematics Community of Practice (CoP), led by the First Nations, Métis and Inuit Education Association of Ontario, is one of four CoPs that are part of the Math Knowledge Network. In 2015, the Truth and Reconciliation Commission of Canada released 94 Calls to Action, which includes mandatory learning about Indigenous Peoples histories, perspectives and contributions in schools K-12, as well as in post-secondary institutions. While these changes to curriculum are underway, Mathematics education is arguably one of the subject areas that is least developed in terms of Indigenous knowledge, pedagogies, epistemologies and methodologies. School Boards: Dufferin Peel Catholic DSB; Durham DSB; Greater Essex County DSB; Kawartha Pine Ridge DSB; Near North DSB; Rainy River DSB. First Nation Communities/Organizations: Anishinaabek Education System; Curve Lake First Nation; 7 Generations Education Institute. Organizations: Association Francophone pour l’Enseignement des Mathématiques en Ontario (AFEMO); Knowledge Network of Applied Education Research (KNAER); First Nations, Métis and Inuit Education Association of Ontario (FNMIEAO); Mathematics Knowledge Network (MKN); Ontario Association for Mathematics Association (OAME); Ontario English Catholic Teachers’ Association (OECTA); Ontario Mathematics Coordinators Association (OMCA); Ontario Secondary School Teachers’ Federation (OSSTF); Ontario Teachers’ Federation (OTF). Post-Secondary Institutions: Dr. Eric Jackman Institute of Child Study – OISE – University of Toronto; McMaster University; Queen’s University; Trent University. International: Te Wharekura o Maniapoto (New Zealand); NASA Astrobiology Program, NASA Science Mission Directorate. Support connections with Elders, Knowledge Keepers etc. Continue Indigenous Focused Collaborative Inquiries. These inquires involve 6 different schools. The inquiries are self-directed with support from central program staff therefore each focus is unique to their own students, school and community context. collaborative work in early years math with Anishinaabe educational leaders and teachers from Seven Generations Education Institute and the Rainy River DSB and students and families they serve. involved in piloting an integrated inquiry with students and teachers that uses math, science and mapping to raise awareness of drinking water advisories in First Nation communities. 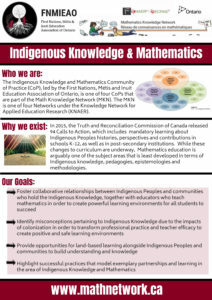 For more details, see the Indigenous Knowledge and Mathematics Education Implementation Plan Document.